I've struggled to hit my stride this week and get back into routine. I've chosen to linger and savour the sounds of the morning rather than get up and make sure all the lunchboxes and eskies are packed. I start one task, only to get sidetracked with another and not remember I had already started one. I'm not sure whether it's the after holiday let down or there's something else ticking over in my mind, whatever it is it's not made this week an easy one, today was the worst of all. In all the struggle though there's been rays of sunshine that I am so grateful for. Having good friends that listen to me rant or worry or just make me laugh, good friends are wonderful and special and I am so very lucky to have some lovely ones in my life. I am extremely grateful to my neighbour who picked up my 'snake sticks' for me today, because I couldn't get to town for another week, now I just need to charge them up before strategically placing them in the house yard. I am grateful for my gorgeous Muddy kids and the love they have for farm life and farming, for the joy they get from going to work with Muddy Hubby and helping out where they can. That is so precious and I hope they never lose it. My Muddy Puzzler has done a complete turnaround on her bus enthusiasm, so I am grateful for the wonderful and caring preschool staff that encourage her and praise her and ensure she feels safe on the bus and make sure she's happy to get on and off. Today though the thing I am grateful for is those 'lightbulb moments' you know the ones, where you've been struggling to find the answer to a puzzle and suddenly inspiration strikes and you see it in a different way and you know how to go forward. Yes, that today I was very grateful for, now to just try and put it into action. 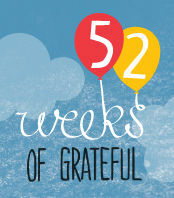 I am linking up with the wonderful Bron who is hosting 52 Weeks of Grateful at Village Voices. Stop by and have a read, you won't regret it! hoping the struggles slip away! I've struggled with the holiday let-down too (and here we are, halfway through first term already!) I think it's always good to keep looking for those rays of sunshine no matter how hard our days are. Beautiful pictures. I hope you find your groove next week! They are so cute watching the shearing like that. What a great image for a city girl to see today, Nat. PS - not sure what snake sticks are, but they sound important!! one of the most important gratefuls are the ones were your week isn't necessarily blissful but if you stop and look around.